Bermagui lies in the middle of a vast coastal range that was occupied by the Djiringanj people for many thousands of years. Nearby Wallaga Lake was the heart of Djiringanj country, the Djiringanj being one of the groups making up the Yuin nation. It was a Yuin word, no doubt Djiringanj, recorded earlier on as ‘Permageua’, which gave the town its name. The first recorded contact between the Yuin and Europeans along the Wilderness Coast was in 1797, when the shipwrecked survivors of the trading vessel Sydney Cove made their way overland from Ninety Mile Beach to Sydney. They followed the coastline, a journey of over 700 km, and 61 days later, only three of the original 17 men arrived. One of these men, Will Clark, recorded their journey, telling of their experiences with Aboriginal people. 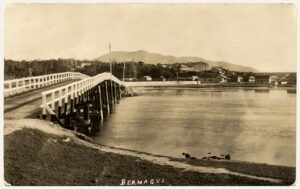 Bermagui became the port for the early squatters taking up land in the Cobargo and Tilba district from the 1830s. 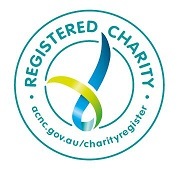 Ships took their produce to the markets in Sydney and returned with much-needed supplies for the growing communities. Although the site proposed for the villages of Bermaguee and Bermaguee South, was proclaimed on 7 April 1868, occupation of the settlement did not begin until 1872, when Thomas Moorhead built a steam-driven timber mill on the river. With an abundance of majestic hardwoods, the timber industry became the lifeblood of Bermagui for the next 100 years. In 1880 a government wharf was built near Moorhead’s mill. At peak times as many as fourteen ships would be waiting to load timber and produce. In the same year, gold was discovered along Haywards Beach and the population increased rapidly. Within two weeks around two thousand people were on the goldfield, creating extra demand on maritime transport. In 1888 two new constructions brought great changes. 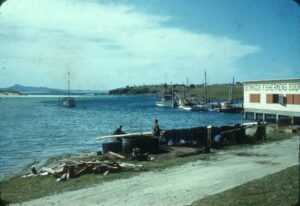 A wooden bridge across the Bermagui River now connected both sides of the town and a deep-sea wharf erected on the eastern side of Horseshoe Bay expanded the shipping trade. 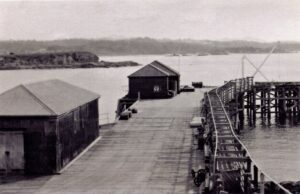 The steamer wharf in Horseshoe Bay was a major feature of Bermagui life until 1952 and had a huge impact on the surrounding districts. 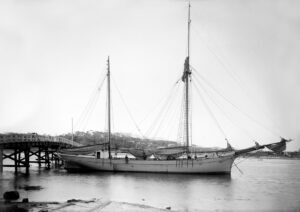 With a fleet of more than 20 steamships, the Illawarra Steam Navigation Company serviced the South Coast, calling at Bermagui on four days per week. The steamships carried both passengers and a range of produce, including livestock. Boarding the animals was a noisy business and it became known as the “Pig and Whistle Line”. The commercial fishing industry began in the early 1900s, providing a valued food source to the early settlers. Before long the ships brought ice from Sydney, for packing the fish and sending it to the markets. In 1948 the first Bermagui Fishermans Co-operative was established to regulate the marketing and hygienic handling of the fish. game fishing started in 1933 when Roy Smith became the first angler to catch a black marlin (weighing 105 kg). Within two years big game anglers were arriving from around the world, the most notable being the American novelist Zane Grey, who became a regular visitor. Grey fuelled international interest in the sport, and Bermagui, through writing and broadcasting about his fishing exploits. He was the first person to catch a yellow fin tuna here, effectively initiating the tuna canning industry in southern New South Wales. With unspoilt coastline, eclectic shopping and internationally acclaimed cultural events, today the small fishing village of Bermagui is a popular tourist destination at the heart of the Wilderness coast. 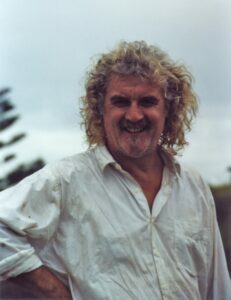 The movie, The man Who Sued God, starring Billy Connolly and Judy Davis, filmed in the town, showcases the pristine beauty of the area. The movie is available through the Museum.